The Sanford FIELDHOUSE is the indoor sports facility in Sioux Falls for local, regional and national athletic training, soccer, baseball, softball, football and the POWER fitness programs. 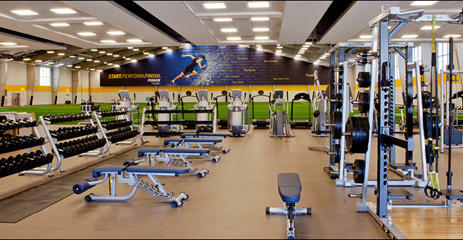 The building is 84,000 square feet designed for training athletes and helping them stay healthy. Sanford FIELDHOUSE is also home to Sanford POWER Athletic Enhancement Program, Sanford Sports Medicine & Rehabilitation, Sanford Sports Medicine Outreach (Athletic Training Program) and home of the National Institute for Athletic Health & Performance. Brett Fischer, physical therapist, Sanford POWER Sports Physical Therapy the physical therapy services available to injured athletes and others and the equipment they use. Lizzie Kuckuck, sports nutritionist, Sanford Sports Science Institute will discuss nutrition services.